Why Worrying About Work-Life Balance is Not A Good Sign. I see so many articles these days talking about creating the perfect work-life balance. That somehow the goal is to have eight hours sleep, eight hours work and eight hours leisure time every twenty-four hours. In many ways, this does seem ideal. Yet in reality, it is a very bad sign. It implies that the work you do is not something you enjoy or love, but is something you do to live. That you work forty-hours a week so you can enjoy yourself on a weekend — where what you actually do is spend most of that time sitting in front of the TV or laying in bed complaining how tired you are. What is really happening, is out of a seven-day week you spend five of those days doing something you hate, so you can enjoy two days where you are not working. Yet, you complain about being so exhausted all you do during those two days is sit around doing nothing but complain. If you worry about work-life balance you are not going to achieve the same levels of success as people like Tony Robbins, Elon Musk, Gary Vaynerchuk or Sheryl Sandberg. Very successful people focus on what they want, and the process, not the hours they work or about how tired they are. If you look at the lives of the super-successful you see a completely different pattern emerge. You see people who can’t wait to jump out of bed in the morning. You see people who may not be in the office at weekends, but are reading, learning and planning so they can do their work better and perform at a much higher level. Their goal is excellence and they have a purpose. I am certainly not suggesting that everyone should forget about trying to have free time or some quality time with their families and loved one. 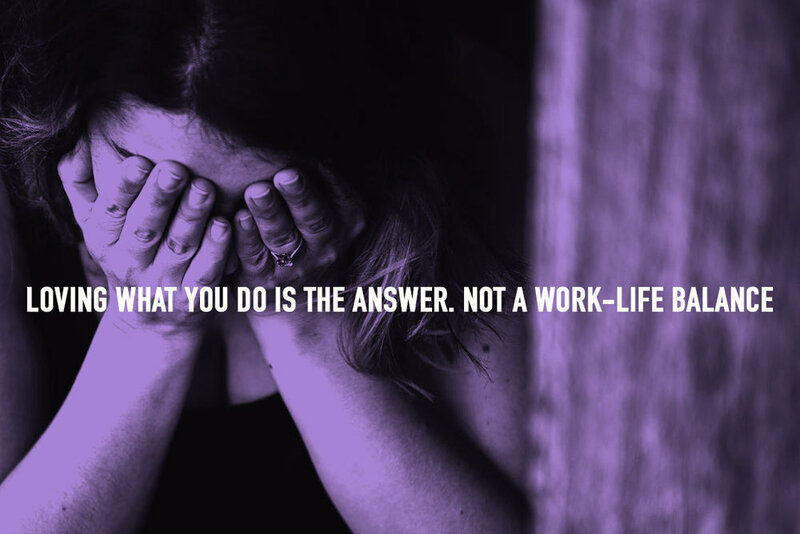 But, if you want to build a multi-billion dollar business, then worrying about your work-life balance is going to stop you from achieving that dream. The funny thing is, the people who are working to improve their lives, that read, study and plan on weekends are the happiest people around. Those that go around trying to create a ‘perfect’ work-life balance are often miserable, exhausted and stressed. Why is that? It really comes down to purpose. When you have a clear idea of what you enjoy doing, when your work is something you love doing, there is no dividing line between work and pleasure. Everything you do is a pleasure. Then the challenge becomes finding time to spend with your family and friends, and although that can be a very difficult challenge to overcome, it is a better place to be than laying around all weekend complaining about how tired you are and then suffering from the Sunday night blues. You might be spending time with your family and friends, but is sitting around on a sofa with your eyes glued to a screen spending quality time with your family and friends? I don’t think so. This year, I have spent a lot of time studying highly successful people, trying to find if there was anything these people had in common. There are a lot of both commonalities and differences, but one thing I did find they all had in common was the passion and commitment they had for their work. Right back to the time of Leonardo Da Vinci, all highly successful people lived and breathed their work. When they got tired, they slept. When they were awake it was all about work. That was true then, it is true now. We read articles about the number of hours Elon Musk spends working, how many hours people like Tim Cook, Satya Nadella, Marissa Mayer and Cheryl Sandberg spend working. They all work ten to fifteen hours a day and on weekends too. None of them complains about not having a work-life balance. Work is their life. That is the balance. What I have found interesting is those people stuck at the bottom or in the middle, not moving up the promotion ladder, moving from one job to another and not being able to find happiness, are the loudest proponents of a work-life balance. It is as if their life’s work is to complain about how hard their work is, how tired and stressed they are and how unhappy they are in their work. Instead of harnessing that energy finding a vocation they really enjoy and love doing, they seem to prefer complaining about it. Of course, it is their right to complain about how hard their work is, but I do feel their energies would be better served finding something they truly loved doing and finding happiness rather than complaining. The secret to a happy and fulfilled life is not really a secret. It is as Steve Jobs said in his famous Stanford University Commencement address in 2005; finding what you love. Finding what you love doing is hard and this is probably the reason why so many people give up and just settle for a job they hate going to and returning home after an eight or nine hour day to complain about how much of a bad day they had. Surely it would be a far better use of your energies to finding something you really enjoy doing instead of complaining about the work you hate doing. Take some time every evening and at weekends to play, to read, to learn and to continue searching for a vocation that pours energy into your life, that has you jumping out of bed on a Monday morning with excitement, not dread, and that has you using your weekends to learn, to grow and to become a better you. It is hard but it is not impossible. The effort finding that place will be worth it. You will be able to say goodbye to complaining, to negativity and to feeling tired and stressed. Instead, you will have huge amounts of energy, positivity and excitement for each day. Now go find what you love. Thank you for reading my stories! 😊 If you enjoyed this article, hit that button below. It would mean a lot to me and it helps other people see the story.